The FACTORY style clear vinyl is 40 gauge AS6 DOT automotive grade vinyl, BRASS zipper and NO bottom trim. CONVERTIBLE TOP + FULLVUE - BLACK PINPOINT VINYL $350. CONVERTIBLE TOP + FULLVUE - COLOR PINPOINT VINYL $365. CONVERTIBLE TOP + FULLVUE - STAYFAST CLOTH $595. TINTED VINYL - (upcharge from CLEAR to TINTED) add $30. CONVERTIBLE TOP ONLY - BLACK PINPOINT VINYL $245. CONVERTIBLE TOP ONLY - COLOR PINPOINT VINYL $265. FULLVUE - FACTORY STYLE - NO TRIM $145. SIDE TENSION CABLES - PAIR - 32 1/4" UPPER $38. 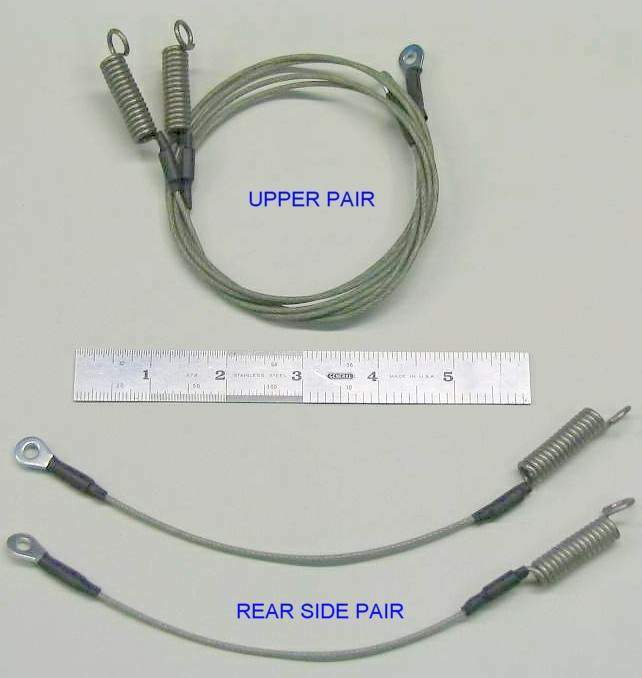 SIDE TENSION CABLES - PAIR - 8 7/8" REAR FLAP $32. HEAVY DUTY PADS - BLACK WEBBING - 4PC SET $65. WELL LINER - BLACK $125.